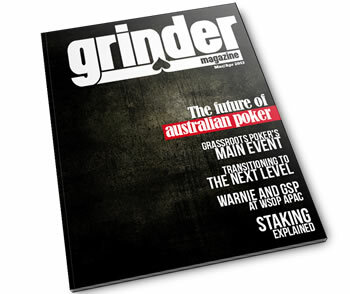 The future of poker has arrived with the exciting launch of Australia’s newest poker publication, Grinder Magazine. Issue #3 has hit the shelves of casinos and pub poker venues around the country! 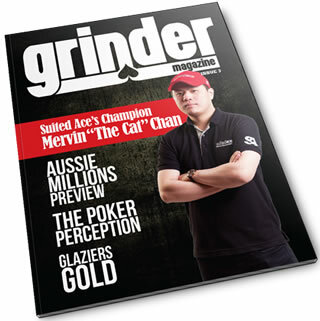 It features reigning Aussie Millions champion Mervin Chan on the front cover and is 100 pages full of fantastic poker news, articles, blogs and a whole lot more from the Australian poker scene. In our feature article, we sit down with Mervin Chan to talk about his year, his association with sponsors SuitedAce and look towards the defence of his title at the 2014 Aussie Millions. We also provide a comprehensive preview of the 2014 Aussie Millions, including a look back at the history of Australia’s greatest poker event. We take a trip around the globe, with Jackie Glazier recalling her amazing win at the World Series of Poker Europe, while looking ahead to the tropical delights offered at events next year in the Caribbean and New Caledonia. Another star on the rise is Australia’s Lynn Gilmartin. We catch up with the WPT hostess to see how she’s handling the international spotlight. This issue also features blogs by Joe Hachem, Grant Levy, and the spin king Shane Warne who provides an interesting insight into the similarities between poker and cricket at an elite level. Former Crown Poker Room Tournament Director Christian Vaughan also joins the editorial team as he takes a look at the controversial first card off the deck rule with an inside perspective of how this rule change came about. The team at Poker Asia Pacific deliver their popular Top Ten lists for 2013, with the Top Ten Players and Top Ten Moments sure to spark plenty of debate. We also have all the latest from the pub poker scene in the lead up to the huge Main Event in February, as well as our regular sports betting feature thanks to Before You Bet.